Representative Honours: Northern Ireland Under-18; Irish League: 7 Caps (1982-1992). Club Honours: (with Portadown) Irish League Champion 1989/90, 1990/91, 1995/96, 2001/02; Irish Cup Winner 1990/91, Runner-Up 1989/90, 2001/02; Irish League Cup Winner 1995/96; Gold Cup Winner 1992/93; Ulster Cup Winner 1990/91; Floodlit Cup Winner 1990/91, 1992/93; Mid-Ulster Cup Winner. Awards: Ulster Player of the Year 2002. 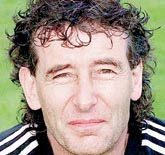 The similarities between Mickey Keenan and Pat Jennings were endless. They were of course both classy goalkeepers with unorthodox styles, softly-spoken which belied their big frames, they came from the same town and same club, and neither knew when to quit. Like Jennings, an admitted hero of Keenan’s, he won Northern Ireland Youth caps while with Newry Town, and like Jennings he was given an early chance in English football – he signed for Oldham Athletic when he moved to Manchester to study as a teacher. When his teacher training was completed Keenan returned to Newry Town where he continued to draw the attentions of some big clubs. Newry’s goal however was senior status, and Keenan wanted to be part of that. He finally gave up on his dream of Irish League football with Newry in 1981 leaving the ‘B’ Division behind to sign for Portadown – two years later Newry were elected to the Irish League proper. It didn’t take Keenan long to evolve from the top ‘keeper in intermediate football to one of the top ‘keepers in the senior game. By the end of his first season with Portadown he had been capped by the Irish League, coming on as substitute for George Dunlop in a 3-3 draw with OFK Belgrade of the Yugoslav League. Throughout the 1980s he plugged the gap at the back for the thoroughly mid-table Portadown. His only reward for his sterling service was a couple of Mid-Ulster Cup winner’s medals and final appearances in the Gold Cup and League Cup in 1987/88 and 1988/89 respectively. Suddenly, out of nowhere, Ronnie McFaul’s Portadown clicked, and Mickey Keenan at the age of 34 had his first major gong, an Irish League winner’s medal. Billy Bingham rewarded Keenan’s excellent form in keeping over twenty clean sheets during that Championship winning season – Portadown’s first ever – with an international call-up in 1990. He further cemented his credentials as the Irish League’s best last line of defence with further appearances for the Irish League in their centenary year against the League of Ireland, Manchester United and the Football League. Portadown confirmed their place in the upper echelons of the local game with an Irish League and Cup ‘double’ in 1991 throwing in the Ulster and Floodlit Cups for good measure only for arch-rivals Glenavon to claim bragging rights with wins in the Gold and Mid-Ulster Cups. The honours continued to come thick and fast for Keenan through the mid-90s, he won further Irish League caps and helped keep Portadown’s trophy cabinet bulging. By 1996, when Portadown won the inaugural Irish Premier League title, his place had been claimed by Timothy Dalton, and in July 1998 he signed for Ards. He lasted just a season in North-Down before announcing his retirement – it was a hasty announcement. In August 1999 Keenan re-signed for Portadown, still in “semi-retirement”, with the intention of acting as goalkeeping cover. In his absence Portadown had just survived relegation by a two-point margin. True to his word his first campaign back at Shamrock Park brought just six League appearances. His next season saw 24 Irish League outings, and 2002, when Portadown won their fourth Irish League title, 34. His performances “in semi-retirement” brought Keenan the accolade of Ulster Footballer of Year. With the Gibson Cup came qualification for the Champions’ League preliminary rounds and Keenan had the honour, at 46 years and three months, of becoming the oldest player ever to feature in that competition. The tie, against Belarus side Belshina Bobruisk ended in a 3-2 aggregate defeat and again Keenan was displaced from the side by a younger number one, Davy Wells. Keenan finally retired (for good) at the end of the 2003/04 season after a handful of appearances for Distillery – he was 48 years-old. Currently Mickey Keenan is goalkeeping coach at Newry City. Summary: 5(2)/0. Won 1, Drew 2, Lost 4.